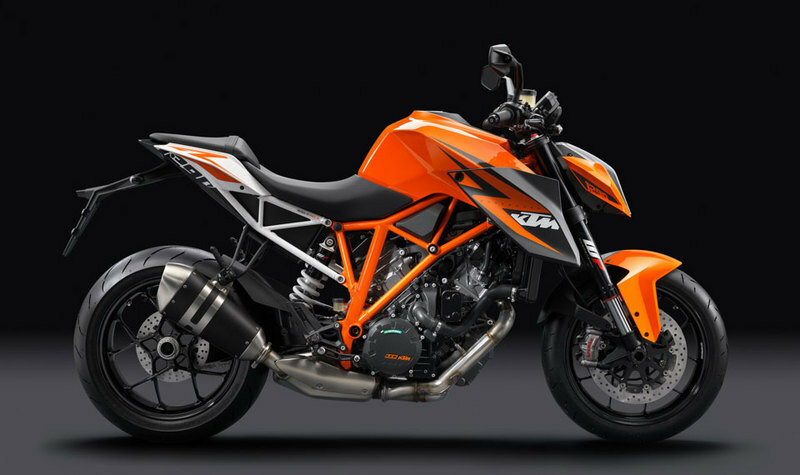 After all those countless discussions and teasers, the all new KTM 1290 Super Duke R has been finally revealed. 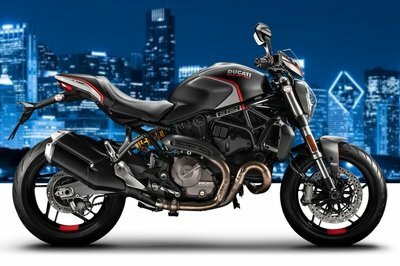 The bike looks certainly better than we’ve expected and it is also more potent than that you might guess. 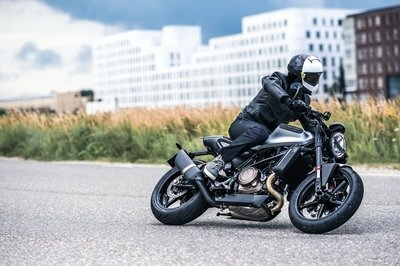 At the heart of this naked beauty lies a 75-degree 108x71mm bore/stroke 1,301cc v-twin engine that puts out an impressive power of 180 HP at 8,870 rpm and 144 Nm of torque. All this power is kept under control by a six speed gearbox and a PASC slipper clutch. Fire up the engine and you’ll hit the 200 kmph mark in no less than 7,2 seconds. The motorcycle’s backbone is represented by a powder coated, chromium-molybdenum-steel trellis frame which is paired with a 48mm WP USD fork and a WP rear shock. 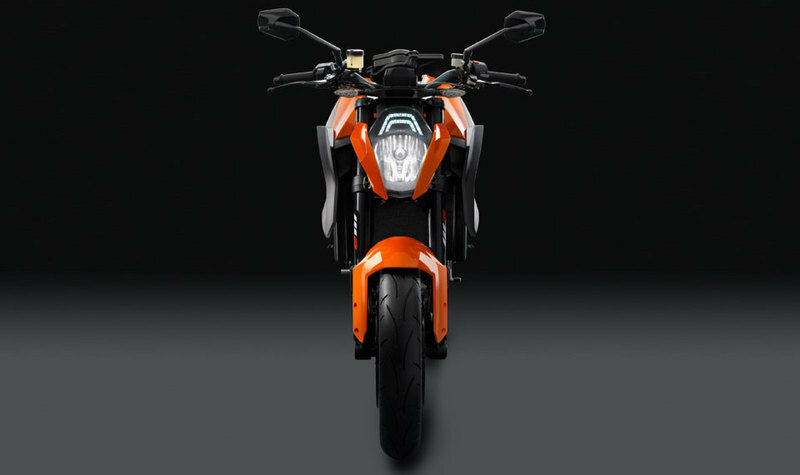 The KTM 1290 Super Duke R weighs 189 kg and its speed is kept under control by Brembo M50 monoblock calipers and 320 mm brake discs combined with a modern Bosch ABS. 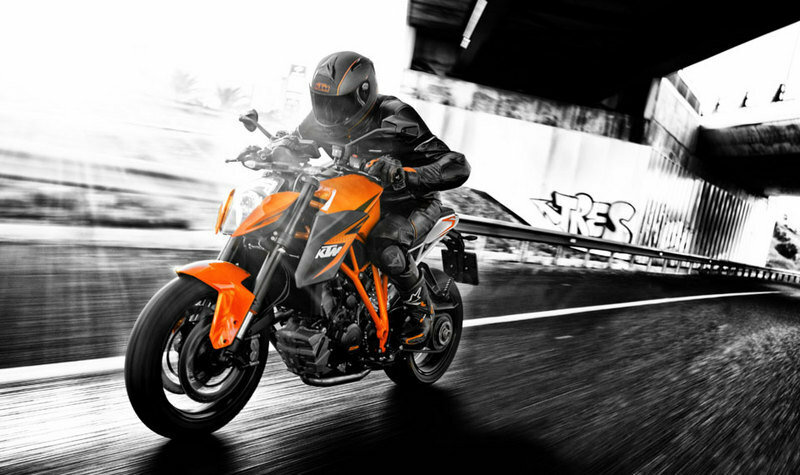 Hit the jump for more information on the KTM 1290 Super Duke R.
What happens when KTM packs the attributes of the proven 75-degree V-twin into 1.3 litres of displacement? The result is an extremely lightweight, elemental engine filled with state-of-the-art racing technology, yet still even more sophisticated, durable and cultivated than ever. 132 kW (180 HP) peak power, 144 Nm maximum torque with 100 Nm as early as 2500 rpm – could there be better guarantees for explosive propulsion whatever the revs? 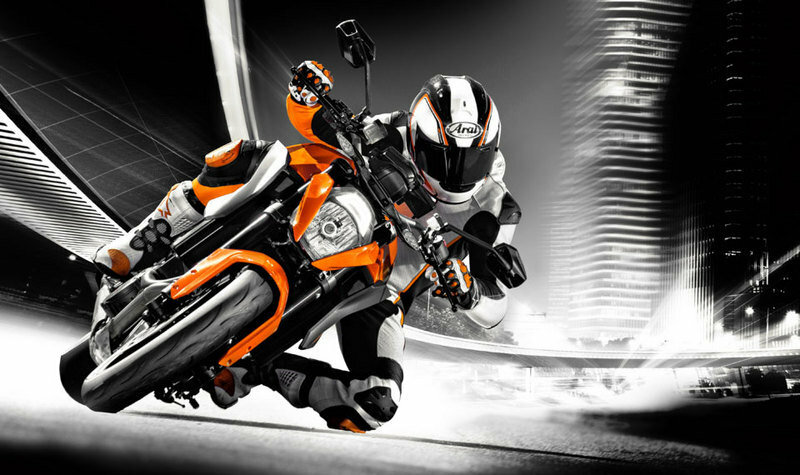 Fast bikes need good brakes – the KTM 1290 Super Duke R bears the best. Brembo M50 monoblock callipers bite powerfully with perfect application into 320 mm brake discs – assisted in the event of an emergency stop by Bosch ABS that’s imperceptible in normal operation, even when riding full throttle. Except of course in Supermoto mode: ABS up front; freedom to slide at the rear! Optimum acceleration as well then, whenever the throttle hand turns a little too wildly. Opening up the throttle is fun – all the more so when it unleashes the elemental force of a 1290 Super Duke R. Nevertheless, overdoing it can end in tears, so it’s great when ride-by-wire intervenes at such moments. The 1290 Super Duke R intelligently translates rider’s commands at the throttle twist grip into electronic opening of the throttle valve. And always in the way that makes best sense. This means, for example, that the engine accelerates more smoothly. And hence that the rear wheel only rotates as much as is just about still healthy. Incidentally, the rider notices none of this assistance. Only that everything always makes optimum forward progress. Party – simply overdo it for once without worries. 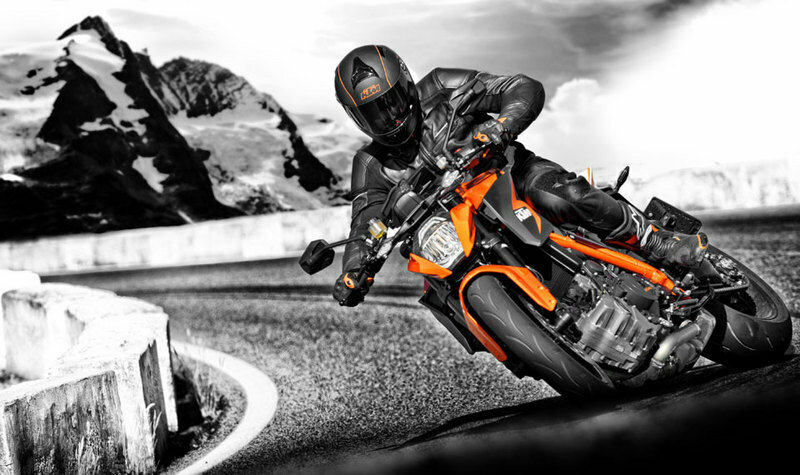 Everyone likes to, which is why the 1290 Super Duke R uses one of the world’s most advanced traction control systems. Open up the throttle. Let the many horses run free. It doesn’t matter - before they start to stampede, traction control intervenes. Sooner or later, depending on the mode selected. But always smoothly and safely thanks to Bosch and Keihin ride-by-wyre. Finest components for perfect handling – for mile after mile of pleasure! Mechanics can be so beautiful – above all, when designers can draw on unlimited resources. Whether it be the CroMo steel tubular space frame, the single-sided swingarm, the fork or the shock absorber, the 1290 Super Duke R is made from only the finest components. Perfectly arranged and tuned with one another, for only so are such excellent steering precision or such gigantic reserves created. 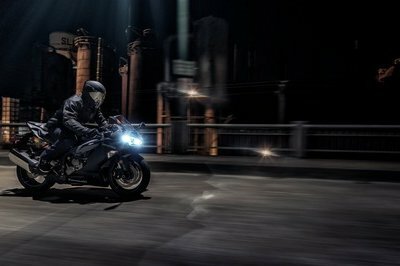 See if you can find anything like it anywhere else – take a test ride! Not only do the intricate, low-pressure, die-cast wheels look good, they are also very stable and light. 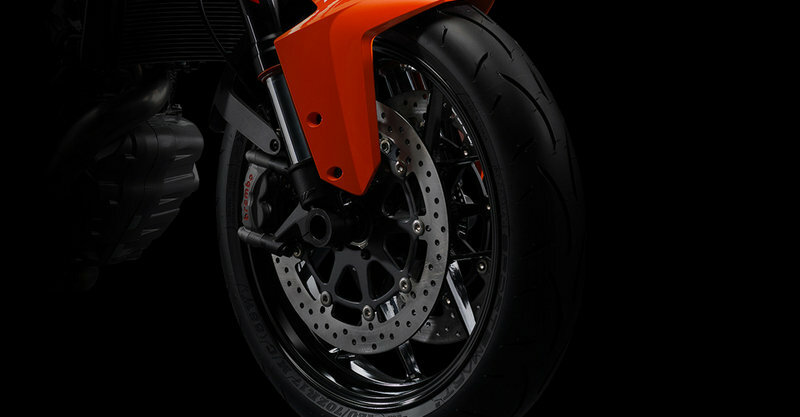 And then the tyres: With seamlessly wound belt stitching and tread, the tailor-made Dunlop Sportsmart² on the Super Duke R enter new technological territory. For even wear, perfect steering behaviour and sensational grip in cold, hot or wet conditions. And fantastic ride stability. Simple wheel changing, easy chain servicing – and still so stylish! 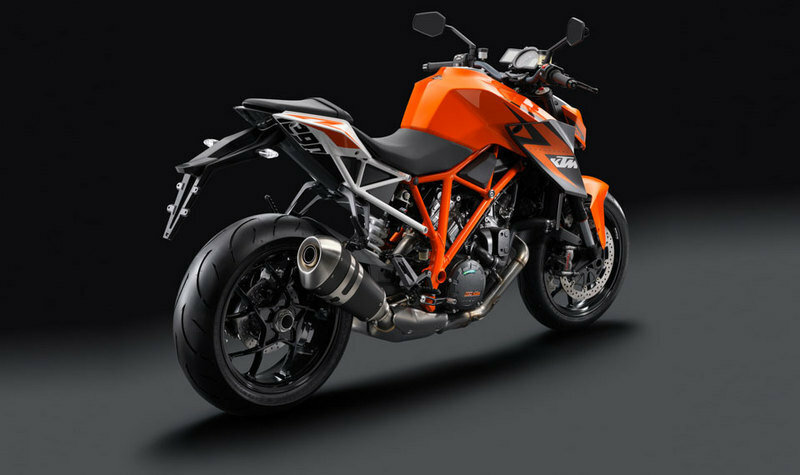 The most beautiful components are created when cost is no object – for example, the singe-sided swingarm on the 1290 Super Duke R. Stiff and muscular, it is a potent partner when the Super Duke unleashes its torque and riding dynamics. With 50 mm rear axle and eccentric adjustment – and still much lighter than normal single-sided swingarms. Normal? Not quite! Simply get on and feel comfortable. Everyone. Male or female. Have you ever thought about seat position? Stack and reach, leg arch length, seat height, seat foam, knee angle and knee contact, handlebar width, position and offset, the Shore hardness of grip rubbers, tall riders, short riders, fat or skinny – a hell of a lot of work and brainpower goes into it. On every motorcycle. 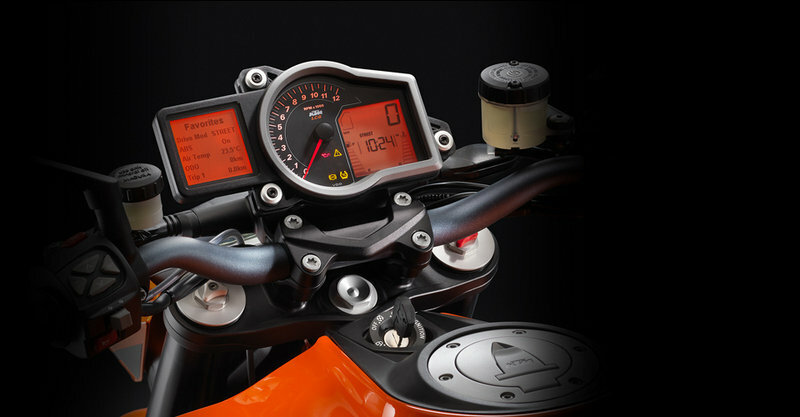 But only on a few is the seat position as successful as on the 1290 Super Duke R. Something we’re very proud of. Extreme? Yes. User value? Still very high. Surprises are best when nobody expects them. 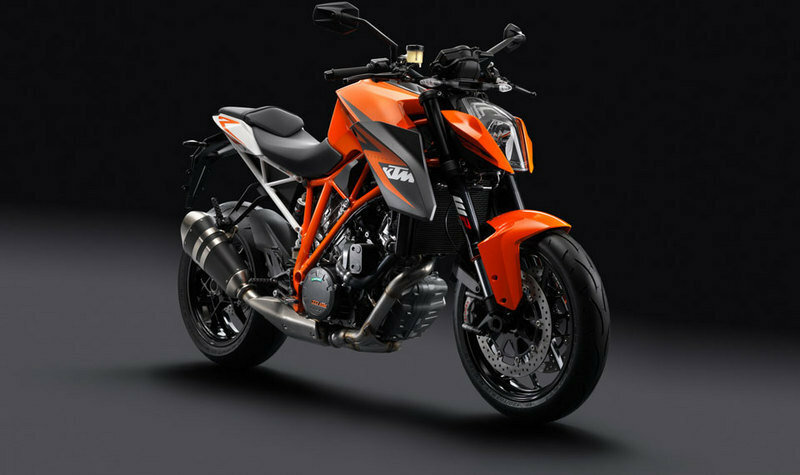 For example, the 1290 Super Duke R is highly economical with fuel. It has a 15,000 km service interval. Daytime running light as standard. An instrument with the most extensive info or the world’s simplest mode switching. A placid rain mode with even higher fuel economy. Amazing wind protection and comfort . As you like it – at the press of a button. It can be well-behaved and gentle, but also wild and spontaneous – the modes change the character of the 1290 Super Duke R perceptibly. Rain: smooth, limited power, with early intervening traction control. Street: sporty but effective, always appropriate and super-swift. Sport? The full works, with sharp teeth and controlled drift feeling. Plus: Supermoto ABS for all pure drifters. 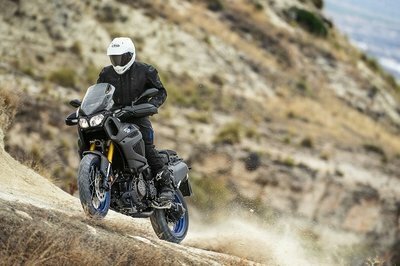 And to top it all, deactivation modes for ABS and traction control – for true tough nuts. CHAIN X-Ring 5/8 x 5/16"